Cohesin and dockerin domains are critical assembling components of cellulosome, a large extracellular multienzyme complex which is used by anaerobic cellulolytic bacteria to efficiently degrade lignocellulose. According to sequence homology, cohesins can be divided into three major groups, whereas cohesins from Clostridium acetobutylicum are beyond these groups and emanate from a branching point between the type I and type III cohesins. Cohesins and dockerins from C. acetobutylicum show low sequence homology to those from other cellulolytic bacteria, and their interactions are specific in corresponding species. Therefore the interactions between cohesins and dockerins from C. acetobutylicum are meaningful to the studies of both cellulosome assembling mechanism and the construction of designer cellulosome. 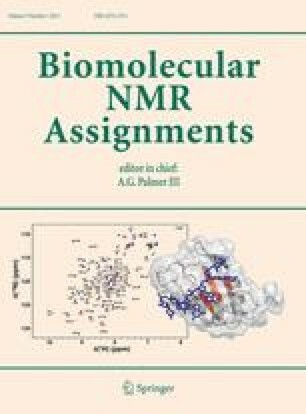 Here we report the NMR resonance assignments of one cohesin from cellulosome scaffoldin cipA and one dockerin from a cellulosomal glycoside hydrolase (family 9) of C. acetobutylicum for further structural determination and functional studies. An erratum to this article can be found at http://dx.doi.org/10.1007/s12104-012-9386-x. This work was supported by One-Hundred-Talented-People program (KSCX2-YW-G-066) from Chinese Academy of Sciences, the National Basic Research Program of China (973 Program, Grant No. 2011CB707404), and the National Natural Science Foundation of China (Grant No. 31100568).